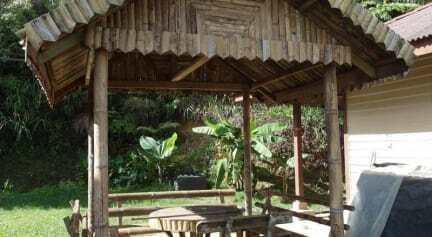 De'Native Guest House is a simple guesthouse with all the basic necessities required by our guest. We are located in the forest so do expect various insects all around our premises. We typically get backpackers and younger crowd staying at our place but families are welcome too. The main building is a 100-year-old colonial bungalow, which was formally occupied by British high ranking officers during the war in the early 50′s. This is one of many colonial bungalows which still dot the hills of Cameron Highlands. Not many people get a chance to stay in one of these old buildings. We have a common kitchen which is free for our guest to use. We also have free Wi-Fi and the barbecue pit for use. There is also a bonfire which we have almost every night. 3. Cancellation policy: At least a 2-day advance notice before the arrival date is required. We stayed for two nights at De'Native Guethouse and had a very pleasent stay. Krish, the owner of the guesthouse, is super friendly and always offers help. The room was very clean and cozy. Would always recommend staying there! Krish and his wife were really good hosts. In the first evening we cooked together and the next day we were able to rent the guest houses scooters. The location is really close to Tanah rata bus station which makes the journey really easy. Their dogs behave well and are really sweet and the rooms and amenities were clean at all times. I would always come back and recommend this guest house to everyone who likes a good atmosphere and to meet new people in an authentic place! It's a very beautiful place to stay for backpacker. We really enjoy our stay there. A special thanks to Chris for this lovely atmosphere. Stayed here for the second time already. It is always a blast, hanging out with the owner Chris and his volunteer in a super familiar atmosphere, singing karaoke and making BBQ in the evening and exploring the beautiful highlands during the day. It is just a few minutes walk to the Bus station and city center. Would fully recommend this place to anyone who looks for an incredible experience. Awesome guest house! Friendly and helpful stuff which was flexible with our late night arrival, good atmosphere and perfect location! Thanks again Chris! Wir hatten zwei tolle Tage im D‘native Hostel! Das Gelände ist wunderschön, es gibt Küche und Kühlschrank, Hängematten und abendliches Lagerfeuer. Die Hunde sind super lieb und süß. Nur noch übertroffen von dem tollen Hostelbesitzer, mit dem wir einen Abend Kochen und Essen durften. Das Essen war Lecker und der Abend wunderschön inklusive Karaokesession! Personal war freundlich. Hatten jedoch 2 Tage kein Wasser! Hat sich niemand wirklich darum gekümmert! Haben uns dann ein anderes Hostel gesucht und bekammen das Geld für eine Nacht zurückerstattet. Bettwanzen // Bed Bugs !!! Einen guten und ehrlichen Rat an alle, die sich auf diese Seite verirrt haben. Vermeidet es unter allen Umständen diese Unterkunft zu buchen. Keine hygienischen Standards vorhanden (auch nicht für abenteuerlustige Backpacker), kein fließend Wasser, kein sicherer Zugang zur Stadt, freilaufende Hunde überall und zum krönenden Abschluss: Bettwanzen. Hier hilft auch kein freundliches Willkommen oder ein lahmes Lagerfeuer am Abend. Gute Reise! The room was overbooked so 2 of us had to sleep in one little bed. the bathroom was dirty. We tried to call the staff and wrote an email because we had questions but never got a response. I wouldn't recommend to stay there.